I do hope nobody here was affected by the wicked Storm Doris. I was taken by the frosty reference photograph, which goes back to the 1920s. 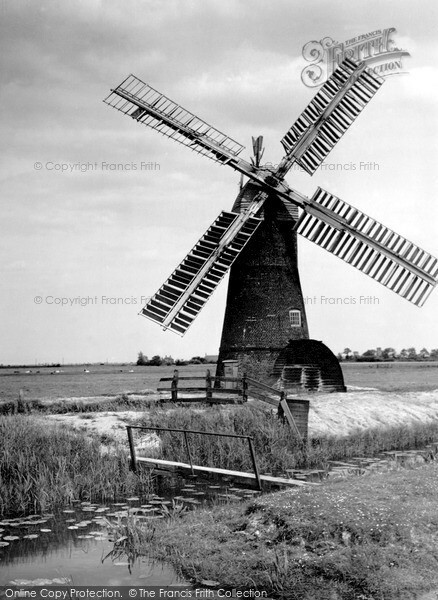 I know nothing of the mill’s profile – it’s just branded ‘The Windmill’ or ‘old mill’ – other than its whereabouts: the village of Potter Heigham. It was curiously attractive and inspirational for that, Doris or no Doris, so I’m sure I’d have got round to this eventually. Noting the off-centre position of the mill in my drawing, moreover that there’s really not all that much excitement behind, I did wonder about an alternative portrait, allowing the mill to have undisputed glory. While it does afford that, I think the vast and remote landscape does just as much, if not more, for the mill’s presence. The enjoyment gained from this suggests it was an itch, and one that essentially scratched itself. The pursuit for a happy medium (fun) will continue, you be sure of it! I felt that a natural next step in this impromptu series would be to look at some ruins – what’s more, ruins almost immediately adjacent to sites looked at previously. While we’re here, and all that! Just a short walk south of Burgh Castle’s Church of St. Peter and St. Paul is what remains of a Roman fort. An imposing site it most certainly is, the walls some fifteen feet of crumbly flint, stone and tile construction, dating back to around 300 AD. One of a series of strategically placed shore forts, its main duty was to watch over and fend off assaults on both Breydon water – which was not so much water as vast inland sea at the time – and the North sea. After the Romans had left Britain, it was reoccupied, believed to be the site of an early Christian monastery and later a Norman castle. The western wall has long since collapsed, tumbling down the hill and into the water and unveiling a breathtaking view across the broadland, now dominated by Berney Arms Mill and passing leisure craft. Needless to say, as if the area weren’t attractive enough to me as a child, this sealed the deal! And it remains quite gripping as an adult, I’d say – coupled with the birdsong, the wind rustling through the trees and a warm, spring sun, one of the most peaceful retreats I know. Large pieces appear precariously askew, but nevertheless are stable – an enduring testament to the skills of those who built them. Many of the wonks were caused by the Norman castle, whose construction entailed breaching several sections of the fort’s south wall, and erecting a giant mound upon which it would perch. While very little trace of the castle itself is evident, the mound is clearly identified, as are the consequences of such a project! More good playtime. Some of the experimental scatter brushes I made to help with the wall’s make-up are a bit iffy, especially in the last one, and I probably won’t use those again, but it’s been quite invigorating trying to capture some of this landmark’s striking energy and mystique. I may yet return to it! Just a few odds and ends in my apparently unending obsession with bygone Broadland landscapes. The scope for this is broad – if you will – and I feel far from over. I could do these all day. As it is, these were all very quick; probably no more than a quarter-hour for any one of them. It’s been a tad chilly lately – and you know it’s cold if I’m noting the drop in temperature, for I can usually go around in next to nothing (a treat of an image for you, there) of a winter without complaint. I think snow was forecast for earlier in the week, but I don’t think it came; if it did, I was in bed, like when it actually did arrive last month. What woe. Still, that prospect appears to have eked through to my landscapes, as the urge came over me to blow a blizzard upon my unsuspecting broadland. The first attempt was pretty unspectacular, a little rigid but on the right lines. I much prefer the second, even quicker attack, and the different aesthetic that came of such improvised quickness. Hmm, perhaps an old, wintry capture of Mill Cottage in its heyday? And, to conclude a rather denser forest walk than in the previous, this time forming a creepy arch. Again, we’re very much dependent on those blurs. At least there’s light at the end, I suppose! Yet another trawl through the Broadland in my mind and further attempts to develop this brisk aesthetic. Yet more fun. After last time I began thinking about the woodland walks beside the waterways, the boathouses and the windmills, for they are often the means of getting to those places. They are quite the beauty spot of their own; what could be more alluring than the snaking pathway beneath an arch of trees? Whatever could be waiting at the end of the line? The uneven, overgrown walkways trailing parallel to dykes and rivers, pathways of their own, separating the wild greenery. I did use this as justification for more playing with water, and building on the techniques used for the vegetation. I intended to do more with this quick render below, namely using it as a reference for a drawing of similar composition, however, it didn’t quite pan out this time. Next time, maybe! Back to resplendence for a moment, as this model has been sitting around for about a month now, waiting to say hello. Here is Clayrack Drainage Mill, a small but very impressive hollow-post pump which dates back to the early 19th century, with its career ending in 1903. Though it spends retirement beside the River Ant in How Hill, Ludham – just a short walk north of Boardman’s Mill and Turf Fen Mill – it was situated in the village of Ranworth until 1981, when it was moved and fully restored. With three different mills so close together, it’ll come of no surprise to anybody reading this that I loved How Hill as a child, and indeed still do. It’s a really lovely place; you not only have these on a nice riverside walk, but also the Edwardian How Hill House and the Toad Hole Cottage, a tiny museum set in what was a marshman’s house. These are the fruits of my playing around with Vue. It’s been something of a mixed bag. While the skies and vegetation look incredible, integration of my Cinema 4D models has proven harder than expected, with a couple of crashes here and there, though I’m quite sure that’s down to my machine not getting any younger. What’s more, the free program stamps even more watermarks over you once you’ve used it for thirty days, as you can see in the above renders. That’s totally to be expected, but they are bothering me, and I have a viable alternative in C4D, so I’m probably going to revert to that. Vue is a great looking programme, though, and comes much recommended. The sun sets on Vue, for now at least. It’s been fun!